Hah! Blogging! Remember that? Er, where was I…? 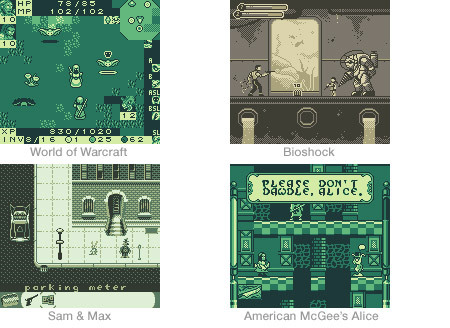 Recently (and by “recently” I mean “over a year ago“) Pixelation ran a little contest on their forum to see who could create Game Boy-inspired screenshots of more recent video games. The entries are fantastic — some of my favourites, World of Warcraft, Bioshock, Sam & Max and American McGee’s Alice, are above. Go take a look if you haven’t seen them already… and if you have it was probably so long ago now that you’ve forgotten about it and should go have another look anyway!